Arrived Friday, can’t put it down!!! Yes, I bet the mid-50s one I played was like an orchestra. Is that a mahogany top? 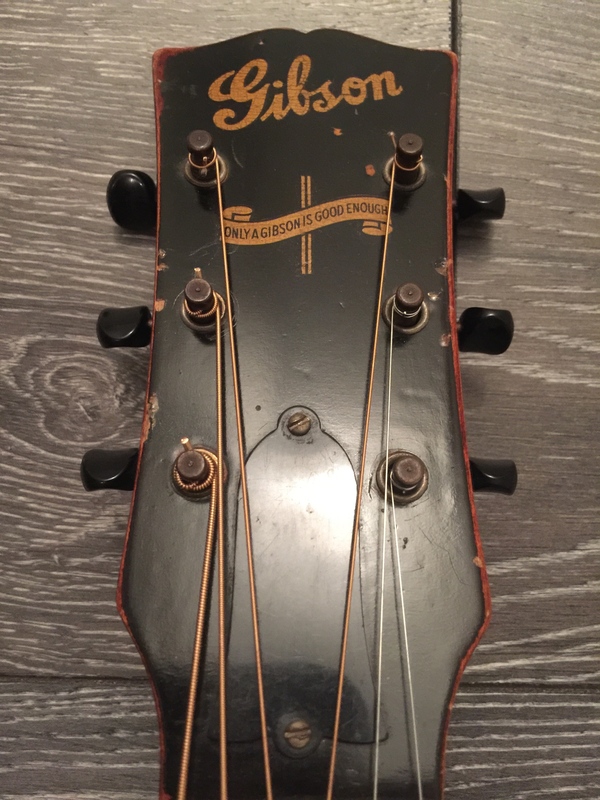 Guessing '43, or possibly '44 as it has a trussrod? @KKJale ;1943... just realised I missed that from the original post. 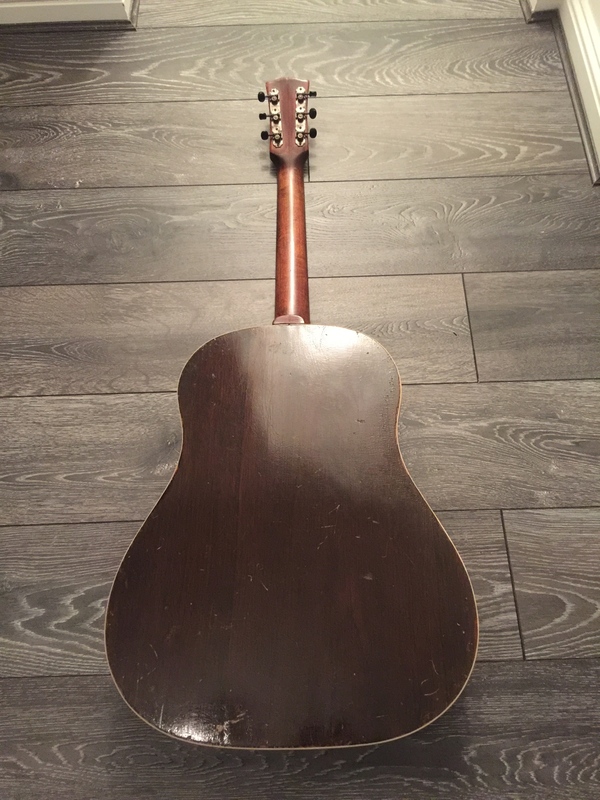 Mahogany top, changed bridge, back of neck has been buffed and back of headstock refinished but all else original. Unmolested internally. What a beauty! Love that headstock design. HNGD. What year is the Gibson? Lovely guitars both. 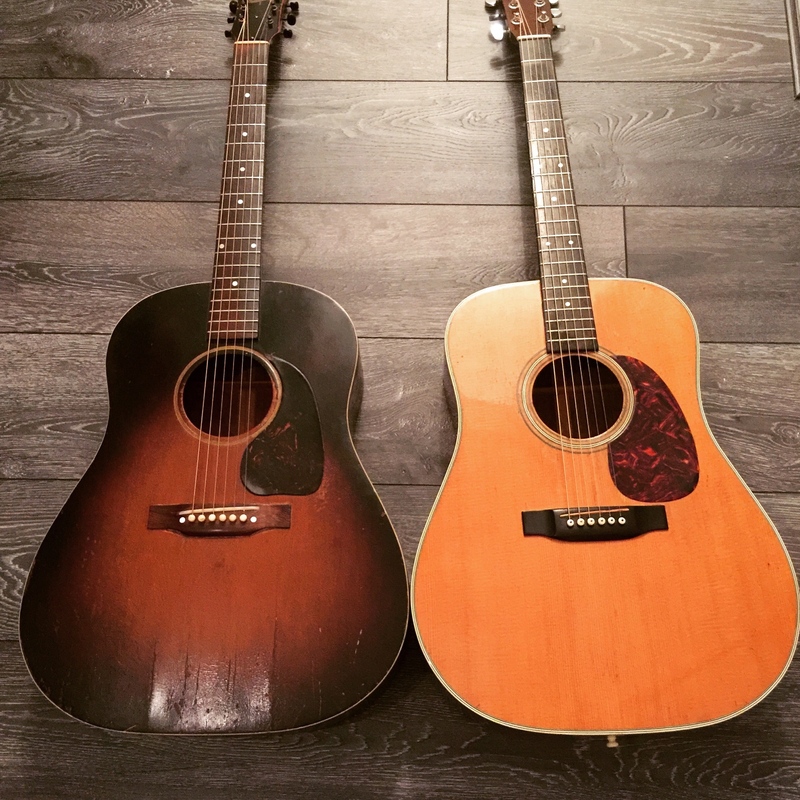 Many of us have an idea how their modern counterparts might compare but how would you describe the differences, subtle nuances and tone of the J45 and the Martin. Once again, wonderful instruments, enjoy! @Koa unfortunately I am not technical enough to give you what you want. I can’t articulate bass response, highs, lows, mids etc but from early side by side impressions here’s my attempt to summarise... and I will get laughed off the forum this.... Think Batman vs Superman!! D28 is Superman. Unassuming, clean cut all American appearance but when played reveals super powers that simply don’t exist anywhere else on the planet (Other than all the other D28s of same spec or even more superior pre war models). It’s brighter, louder and more powerful in the room than the J45. J45 is Batman the moodier darker and far more interesting of the 2. It can’t compete with the powers of Superman but somehow finds a way to compensate and level the playing field. 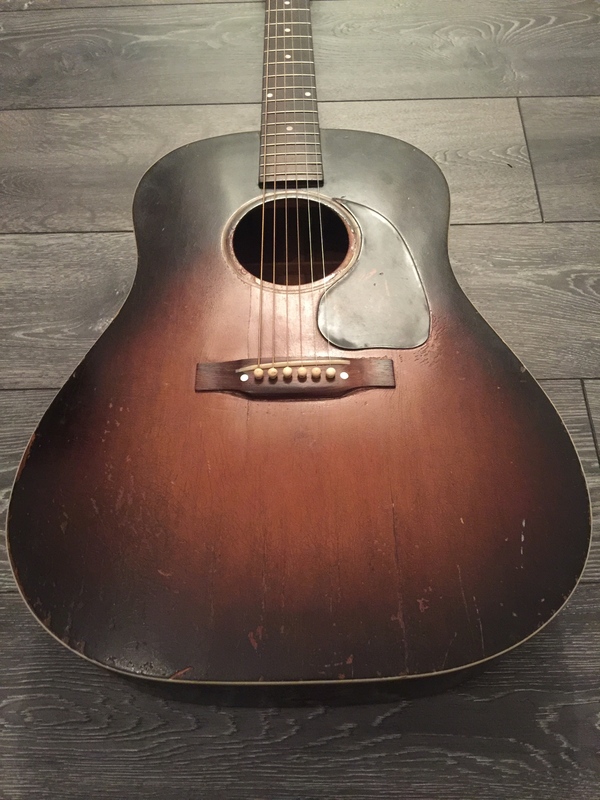 I think the J45 is the most used acoustic in history for recording hence it’s known as the workhorse and it tells when you play it you swear you can hear the original track booming right out of the soundhole. Anyway thats all very cringey and corny but maybe will make sense to somebody somewhere lol. Wow. Gorgeous. Love it ! That's a dream guitar for me - I recorded with one eight years ago and didn't want to leave it at the studio! @p90fool ;Got a link to that recording? I was targetting a 50s/early 60s J200 but think with these 2 I have all I could ever want... in fact one would be more than enough. Just had a look and it's disappeared from YouTube, as has the artist. 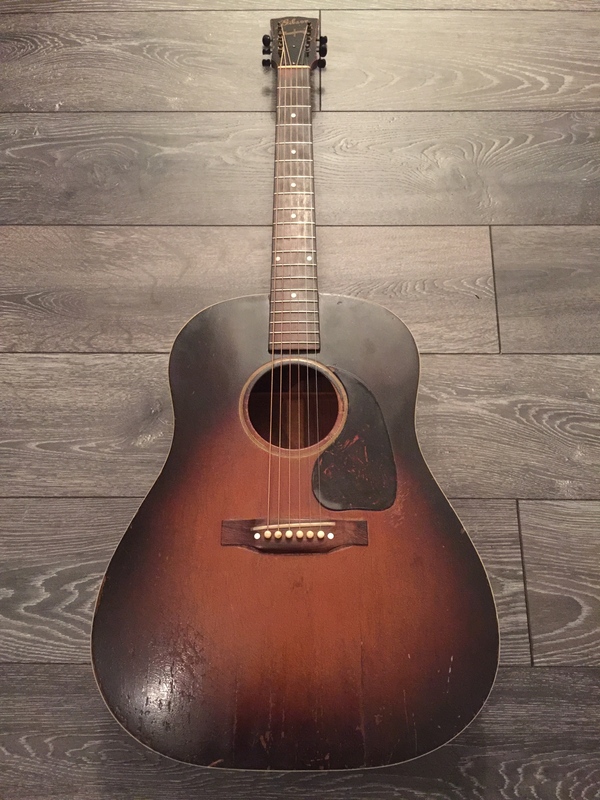 I'll dig out the CD and upload it again if I can get the singer's permission - I also played a 40s Martin on it, but have no idea what model. Cool would be good to hear Did you have a preference between the 2? What a great J45, please upload some sounds - I want to hear it !